KBC Ireland said it is taking additional measures to ensure the safety of its staff. Windows at the Swords branch of the bank were smashed yesterday morning and a fire was set inside. THE UNION REPRESENTING bank employees has written to KBC Ireland’s CEO requesting it review its staff security procedures and its approach to arrears. A number of branches of the bank have been occupied by anti-eviction protesters in the last week. Some have also been the target of criminal damage. 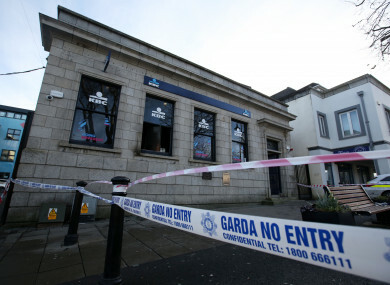 Windows were broken and a fire was started at the bank’s headquarters in Dublin on Thursday night. This building was also occupied twice yesterday by protest groups at different times. In the early hours of yesterday morning the Swords branch of KBC was also targeted. Front windows were smashed and a fire caused extensive damage to the building. The Financial Services Union (FSU) said it is seeking an urgent meeting with management to discuss staff security and welfare. In a letter to KBC Ireland’s CEO Wim Verbraeken, the FSU’s acting general secretary Gareth Murphy called on the bank to offer better support and protection for staff. He said a number of staff had contacted the union “extremely upset and stressed by these developments”. “All staff are entitled to safe and secure working environments. KBC must now put extra effort and attention into making sure staff are not at risk,” he wrote. “I would call on you to audit all roles in KBC that might be vulnerable in this context and to put in place extra security procedures and precautions to make sure that no KBC staff are at risk. A KBC Ireland spokesperson said the bank is “taking additional measures to ensure the safety of our people and the hubs that our local customers rely upon”. Murphy also called on the bank to address some of the “public anger and concerns” about KBC’s approach to dealing with arrears and non-performing loans. As a bank you made these loans and so you must take your share of responsibility for ensuring that sustainable solutions are put in place for customers. I would call on you to engage with experts in this field, like the Irish Mortgage Holders Organisation, and address this situation. Murphy said he can understand the public anger, but he said it is vital that the public remembers that ordinary bank staff are not to blame. The KBC spokesperson said the bank works with customers in financial difficulty to seek sustainable solutions, “while being clear and fair in our communications and dealings”. Email “Union says KBC staff 'extremely upset and stressed' by recent incidents ”. Feedback on “Union says KBC staff 'extremely upset and stressed' by recent incidents ”.